The decision on where to head for a bit of birthday fishing came down to finding a spot on the Truckee that was not pumping, heading south to the Rosaschi or trying out something new like Pyramid Lake. I have been hearing good things about the fishing this season so Pyramid Lake wins the draw. I did pack my 8-wt based on this conversation and it turns out this was a very good move. A short drive out this morning from my house, a quick stop at the tribal general store to purchase my daily permit and I was at the Lake and ready to…get blown all over the place. 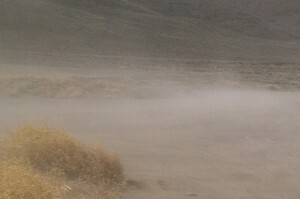 The winds were very brisk to say the least and were gusting up to the mid-thirties. That definitely did not stop the crowds from descending upon the Nets. This is only a small swatch of the Nets. I snapped a full panorama of shots at the South Nets beach. What you see here is but one small section. Notice the “sticks” lined up in the water? Well those are the anglers. What you do not see in this shot is the fact that the line up continues for a quite a few more yards and that most of the cars were actually a bit higher up off the beach. 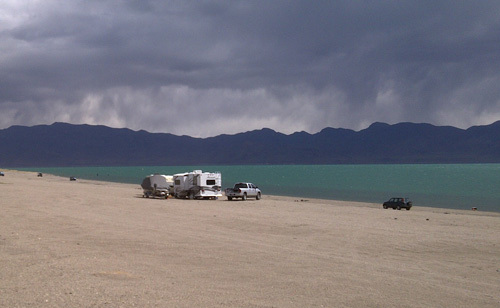 This is the infamous “ladder” fishing of Pyramid Lake. Despite the crazy winds and the intermittent rain squalls, I witnessed some of the anglers hooking up on fish. A good sign! So now it is time for me to hit the water and get serious. I started driving along the shoreline. I had a tip from the fly shop employee, the same one that told me I needed to bring a bigger rod, so I headed in the direction he indicated. I must admit that he did not steer me wrong. When I arrived at the mentioned beach, it was vacant. Now if only that wind would go away. Just a wee bit windy today! 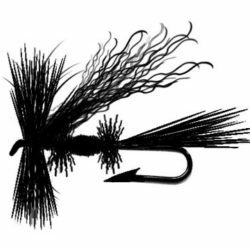 The pre-fish drill, you know, the one that starts with stringing up the rod and ends with tying on the starting fly, a wooly bugger in this case, does nothing to excite me about tossing a big #8 Dennis Estrada bugger that I had in my bugger barn. It is wind like this that cause big flies to impale their casters. A short walk to the waters edge and I am stripping line and trying in vain to cast in the wind. Pretty futile efforts, despite the big rod. After about 20 or so drifts, I decide that I am not made of whatever those other anglers sitting on ladders in water with 12-14″ white caps are made of and I call it quits. 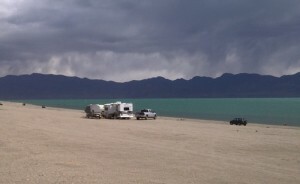 My takeaway today is that Pyramid is a beautiful high desert lake and the Cutts in the Lake are big and healthy. I will be heading back in the next few weeks, just on a day when the weather reports shows the winds to be negligible. Dude you gotta fish from the tufa outcrops on the shore next to the boat ramp. I can’t remember the name of the beach, maybe separator. 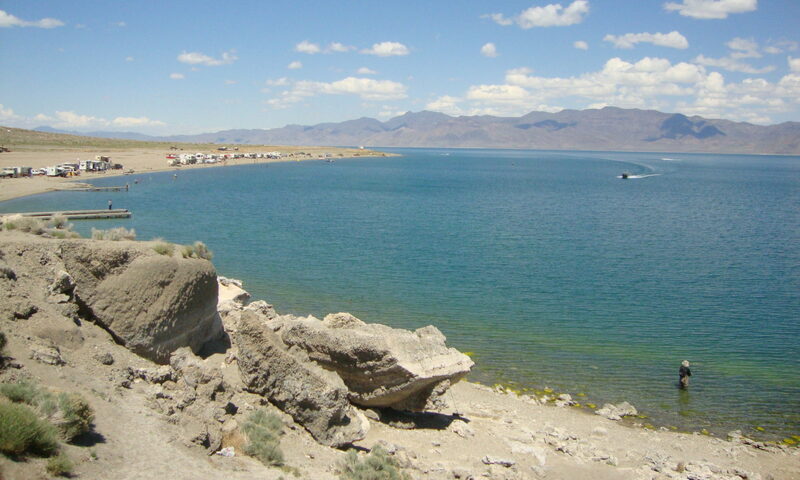 The rocks are to the east of the boat ramp, there is a little road that leads right to them. Rig a black bugger with a green mahalo nymph or a green mahalo nymph under an indicator and get ready for a 20 fish day. You need to be there at dawn- no wind and a chance at rising fish within 20 feet of the rocks. 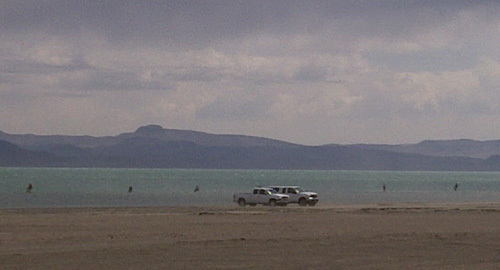 Dude you gotta fish from the tufa outcrops on the shore next to the boat ramp. Thanks for the tip! Is the ledge within casting distance or is a ladder useful for this particular spot? Next PostNext New Season – New Toys!